Have you or someone you know ever leaked when you have coughed, laughed, sneezed, or during exercise? If so, then this is probably something called SUI – Stress Urinary Incontinence. Based on the statistics that I have been checking out, SUI is more popular than I realized. I know that I know a couple of people that suffer from SUI and their age ranges vary. 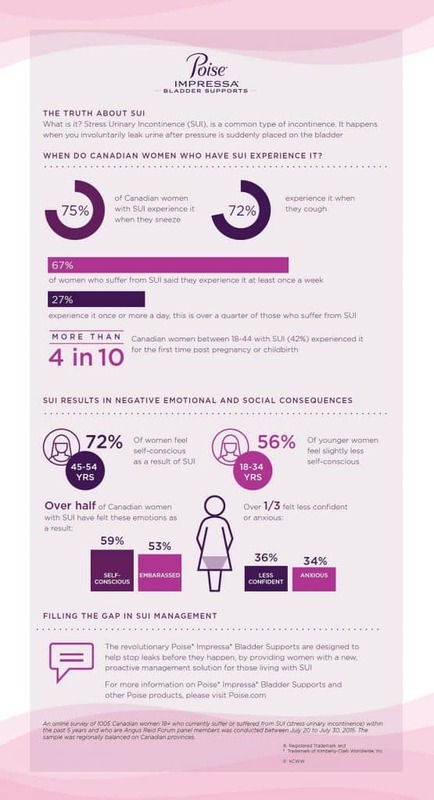 Check out this Poise Impressa infographic about SUI. For those that I know that suffer from SUI, it certainly is uncomfortable. A sneeze and a leak. A cough and another leak. Straining too much during play time with kids, exercise, or out for an evening dancing and a leak can sneak up on you. From those that I have talked to, they just do not want to be wearing a pad. A pad is bulky and uncomfortable. Not wearing something to absorb those leaks can really impact your confidence as well. Seems like a lose, lose situation….until now….. Enter the Posie Impressa Bladder Supports….. 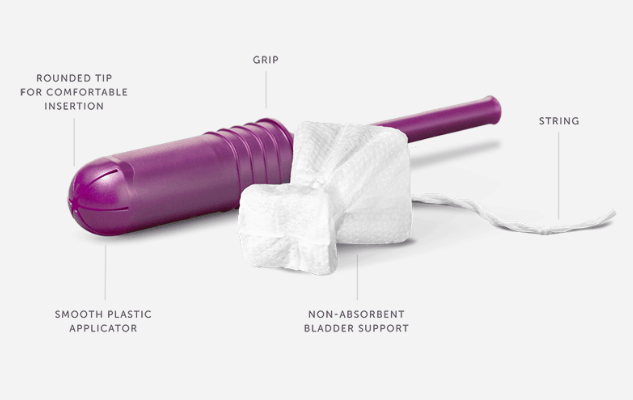 The first thing I have to say is that Poise Impressa Bladder Supports are for those that suffer from SUI. Poise Impressa is not for Urge Urinary Incontinence or Mixed Incontinence. If you are not sure which type of Urinary Incontinence you have, then as always, I recommend that you go talk to your doctor. In general when it comes to health and welfare, I am not a doctor and I always recommend that you talk to your doctor first before trying any products relating to your health. 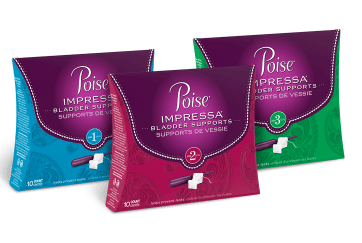 If you or someone you know suffers from SUI and you have determined that Poise Impressa is the right option for you to try, then the first step is to get the Poise Impressa Bladder Support Sizing Kit. The sizing kit comes with two of each of the three Poise Impressa Bladder Support sizes (Size 1, Size 2, Size 3). The sizing kits retail for $9.99, but to get you started, here is where you can go to obtain a coupon for the Poise Impressa Bladder Support Sizing Kit. *If you need lubricant of some type then use it to ensure the application is smooth and comfortable. *Try the sizing starting with the smallest first to see if the smallest is comfortable and gets the job done. If not, then move to size 2 and so forth until you find the right support and comfort zone. *Remember not to flush the supports after use as they are not meant to be heading down the toilet. *When you insert the Poise Impressa, if you need to adjust it to make it comfortable, you can do so with your finger. 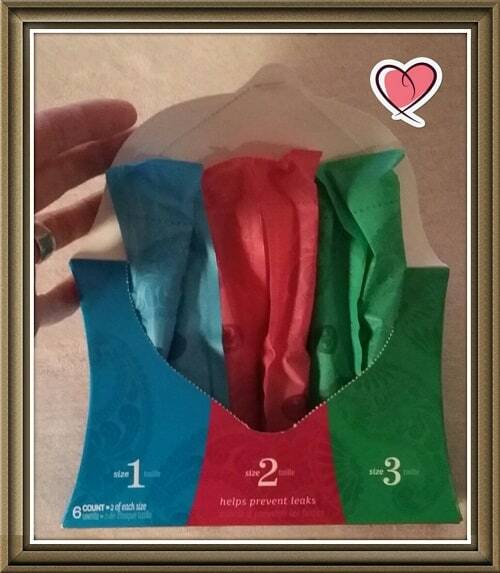 *Only use each Poise Impressa Bladder Support for a maximum of 8 hours. Here are the complete instructions for the Poise Impressa Bladder Supports. The Poise Impressa Bladder Support is different than other products. It does not absorb the urine, but rather it is an over-the-counter intravaginal device that puts pressure to help control bladder leakage. Once you know the size that you need, you can move to purchasing Single Size Packs that have 10 of the size you need right in the pack. Don’t forget to go grab the coupon for the Poise Impressa Single Size Packs as well. I have a friend that is going to be putting the Poise Impressa Bladder Supports sizing kit and products to the test over the next couple of weeks. I will report back on her experience so make sure to stay tuned to find out how she made out….. In the meantime, you can explore and find out more about Poise Impressa Bladder Supports by visiting them here…..
Disclosure: This post was sponsored by Poise Impressa as part of an Ambassador Activation for Influence Central. I received complimentary product to facilitate my review.